Invalid Configuration Location pop up. This sometimes happens when the Parasoft Test tool was used on one user's account, and then another user is trying to use the same installation. Eclipse uses its configuration directory also for caching some common data files, so when multiple users try to use the same installation this kind of conflict may occur. 2) Your Linux file system does not support file locking. This does not happen often, but some Linux distributions have this problem. where @user.home will be expanded automatically by Eclipse to $HOME, which means that each user will have his/her own copy of the configuration folder. The next time you start the Parasoft tool through the GUI or CLI, you will see the folder created automatically in the current user's $HOME. Make the parasoft/test/9.X/configuration folder and its subfolders writable for everyone, and make sure umask setting of all users is not preventing others from writing to the files. E.g. umask of 002 should ensure appropriate group permissions. However, this solution may be too insecure for many organizations. 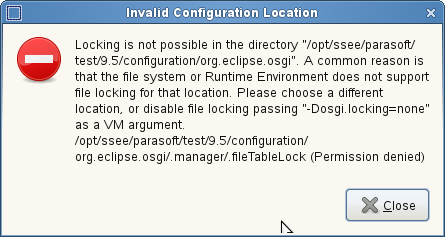 Similar to solution 3, apply "-Dosgi.locking=none" in the eclipse.ini file used by the Eclipse that the Parasoft Tool is plugged into.